I’m starting to think I have a camel obsession. But their lovely, long fluttering eyelashes, their sweet faces and their thick, matted hair just get me. 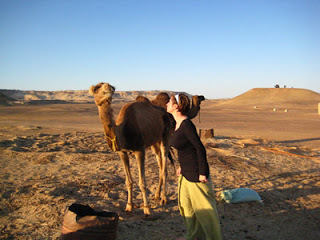 Which is why I’m now lugging a 4kg camel blanket which I bought in Bahariya Oasis. The Oasis comprises eight villages strung between sand dunes and dry, barren plains, four or five hours by bus from Cairo. It took an hour to get through donkey- and pyramid-ridden Giza and out of Cairo’s outskirts, then the new cities started, new towns with such optimistic names as Green Valley, which are also part of Cairo’s 20 million-strong population. It was flat. Really flat. The skyline was obscured by dust, which could be pollution as well as desert sand, and the only buildings on this road were oil maintenance sheds, where a lone passenger would depart, to walk into…where? The empty desert? After pausing for a split second to dump the lone passenger, the bus would then pick up speed again to 140km, sitting in the centre of the road. At Birawati, the main town of the Bahariya Oasis, we were spat into the waiting arms of a swarm of touts till I found the driver who’d take me and three others out into the White Desert. 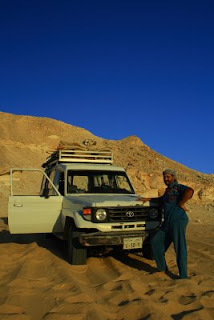 Ashraf, in his grubby blue tracksuit, pulled up an old Landcruiser stuffed with sleeping bags, mattresses and food to barrel out into the desert. Sometimes it’s ok being able to speak only English. Of the five of us in the van, the Italian, French-Canadian, Egyptian and Spaniard all spoke at least a few words of English, definitely the linga franca. That night, Ashraf cooked sensational rice, potatoes and tomatoes, and – mysteriously – chicken (um, from where? We were in a hot car for at least three hours) and we had even managed to prise some beer out of a ‘Bedwin’ shop en route. 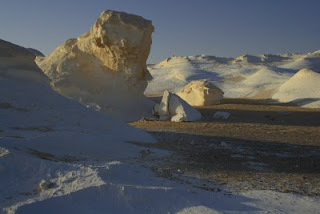 The floor of the White Desert is paved with blindingly white chalk plains and eruptions of soft chalk, escarpments that have been whittled away by the wind to fantastical shapes. They are fragile and beautiful…and ideal for travellers to climb upon to get early morning shots. We pulled into a camp area, passed a large bus full of what looked suspiciously like Kiwis and Aussies playing cricket, to find a little alcove where Ashraf laid out the kitchen, we made our beds beneath the stars and that night, tried to fall asleep beneath a full moon so bright, it cast shadows across the earth. The next morning, everyone else in the desert had gone except us. I watched the big, orange sun break like rich egg yolk over the desert, but Ashraf woke only when I whistled to him and nudged the van (he was obviously over sleeping on the ground like us, and had curled up amongst our bags in the 4WD). We waited for him to complete morning prayers then he laid out breakfast of bread, jam, cheese, tea and nescafe, which the Italian stared bleakly at, unable to bring himself to sit down. Probably the best blog yet Belle… Worth waiting for.